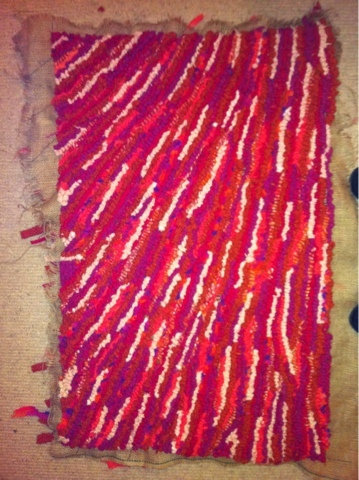 Sarah's Rags: Finished Edith's rug! Personally I am pleased with it and I do not think this photo really does it justice, but now I look at it from a distance I see that it is wider at one side than the other. DAMN! I over estimated the quantity of rags needed and have a small bagful of pieces left over. Almost a whole small (child size?) light pink tweed coat. This light pink tweed is a lovely texture but in this photo looks like white lines. Some of a red wool coat. The next job is to trim the back, and find some binding to use when glueing a backing piece to it.